Choosing the right stove for your home can be a minefield, whether it is matching the colour with your furnishings or having the glass big enough to show off that flame picture you love so much, it’s not an easy decision . With so much choice on the market at the moment it can be easy to forget one of the most important things, how well does your chosen stove burn the fuel? Making sure your stove not only provides sufficient heat and looks good but also knowing it is efficient and clean burning is all part of having the perfect stove for your room. Here at Wakefords we like to make sure that the stoves we recommend can take the heat and stand up to the test. 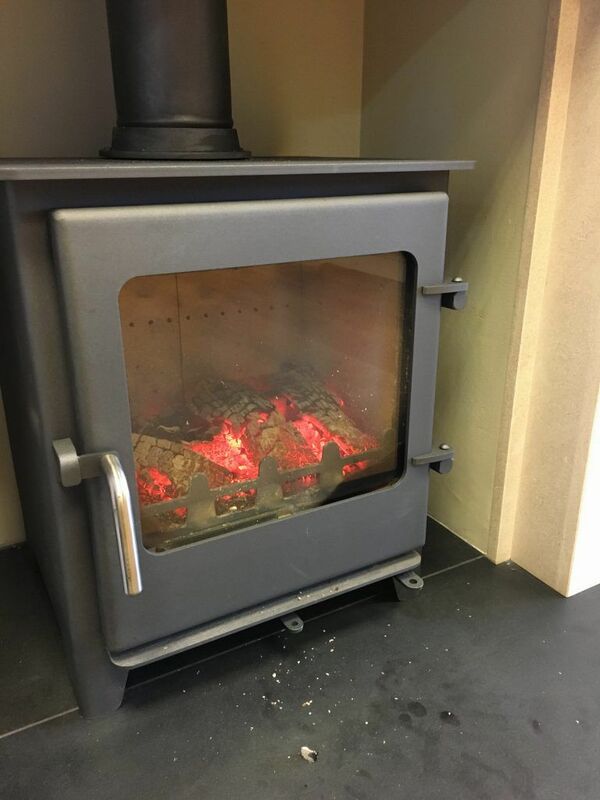 We had a new Town & Country Saltburn stove put into our showroom by Alex, one of our skilled fitters, and wanted to put it through its paces so we can say with confidence that these British made stoves are a cut above the rest. 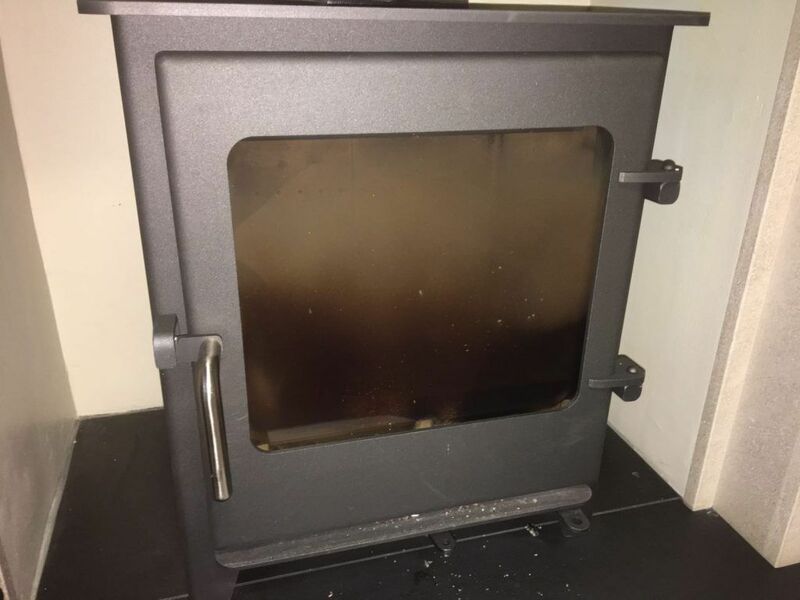 We spent an afternoon purposely burning the wood in our stove at a low heat with minimal aeration so we could create incomplete combustion (not something we would recommend doing) which coated the door in soot and other products of incomplete combustion making the glass almost opaque. Over night we let the particulates really stick to the glass so we could give its airwash feature a real test. The next morning we set up a camera and recorded a time-lapse of the stove cleaning itself with nothing but kiln dried wood and air. The airwash system working well is a good sign of a clean burning and efficient stove. The airwash is usually delivered by secondary air being directed down along the front of the glass. The air is heated as it is drawn into the stove and washes over the glass removing the products of incomplete combustion. This keeps the glass clean for that nice flame picture you so carefully chose. As we expected the Town & Country Saltburn Multifuel Stove performed a perfect example of a well functioning airwash system. The glass cleared in under an hour and only needed a quick wipe down to have it back to new. One thing worth remembering about an airwash system, it won’t function properly on sticky tars that come from burning unseasoned wood or other prohibited fuel types. The moisture can lower the temperature of the stove causing incomplete combustion and can reduce the effectiveness of the airwash. For an example of burning wet wood, or fuels that aren’t appropriate for a stove, another article on this at its most extreme is available to view on our news page. The Saltburn Multifuel Stove is one of a range of highly efficient, clean burning stoves from Town & Country that give a great example of what modern stoves can do. For more information on the Saltburn and other Town & Country Stoves visit their website: www.townandcountryfires.co.uk or visit our showroom to see the Saltburn in action.